In a debut fantasy novel, Wulff imagines an epic conflict between humans and a neighboring dimension populated entirely by rats. Walt is a scrappy, car-obsessed teenager who runs away from a broken home to live with his uncle. 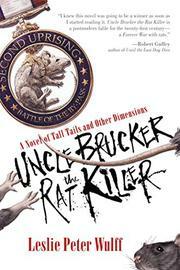 Uncle Brucker is a strange man, a “Rat Killer” and an unlikely war hero who lets Walt fix up old cars and introduces him to his odd trade. Walt learns to track rats, to speak words in rat language, and, with the help of a cheap pair of sunglasses, to identify people who are somehow turning into rats. Uncle Brucker also tells Walt about the history of conflict between humans and rats. Rats once ruled the world but were defeated by humans and pushed into another dimension from which they stage occasional uprisings and plot their return to power. When Uncle Brucker is sent on a rat-related government mission, Walt finds himself following in his uncle’s footsteps and journeys to Rat Land to assist him. Wulff depicts both the human world and the rat dimension with gleeful, quirky enthusiasm, but the novel suffers from inconsistencies in tone and basic mechanics. It is unclear when things are meant to be funny and when they are not, and the discomfort of not knowing overshadows the reading experience. The story also struggles with a general lack of cohesion and with point of view, jumping and switching between viewpoints in a way that seems unintentionally confusing. Scenes shift inexplicably and with no transition. Characters appear out of nowhere with no explanation. The plot rambles, wandering in various directions without gathering momentum despite the battles and outrageous developments that should push it along. It all feels strangely unfinished, as if the energy of Wulff’s imagination became impatient with the long process of translating itself into a novel. A promising premise that stumbles on the basic components of storytelling.